398 pages | 19 B/W Illus. "I think that is is a relief to read a young academic who refers to Marx and Engels…I really recommend this book and hope that also some politicians are going to read it, so we can have a more cooperative and less competitive future." 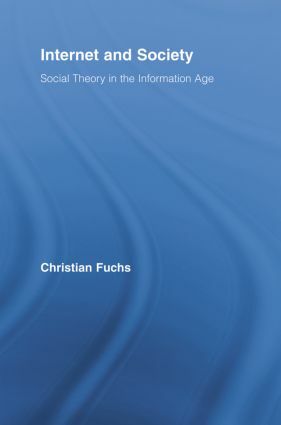 "Fuchs's approach to social theory is reminiscent of Jürgen Habermas's in more than one way. … Fuchs provides a thoughtful analysis that not only engages the most prominent literature but also produces a clear voice which cuts through many of the clichés regarding the information society." "Without building critical tools described in this book, the moment for positive social and political change may indeed turn dystopian, as the opportunity evaporates to conceptualize society as cooperative systems of interactions." Christian Fuchs is professor and chair for media and communication studies at Uppsala University's Department of Informatics and Media Studies. He is also board member of the Unified Theory of Information Research Group (Austria) and editor of tripleC (cognition, communication, co-operation): Journal for a Global Sustainable Information Society. He is author of many publications in the fields ICTs & society, media & society, information society studies, and critical theory. The planet is being transformed by technical change and in particular by the speed of development in information technology. This series brings together the latest research on the social impact of IT and seeks to provide a broad range of case studies and comparative analysis of this phenomena and how it is changing our lives.